Prior to the Spider-Verse event (in which Spider-Gwen was introduced), Gwen Stacy’s father, George Stacy, was ordered as captain of the NYPD to hunt down and detain Spider-Woman, as she is considered a public menace. At the start of Spider-Gwen, Captain Stacy- currently unaware of Spider-Gwen’s secret identity as his daughter- is more than happy to do so. Upon hearing about this, Wilson Fisk, aka the Kingpin, one of New York’s most prominent crime bosses, decides to ally himself with Spider-Gwen- for reasons unexplained- and sends Matt Murdock (better known as Daredevil on Earth-616, the main comic book universe) a corrupt lawyer, to send the assassin Aleksei Sytsevichto kill Captain Stacy. During all of this, Gwen’s band, the Mary Janes, is about to play a concert- the first major one of their career as a band. Gwen arrives late just in time to see her father being attacked by the assassin and quickly dispatches him, but ends up being cornered at gunpoint by him. To avoid getting shot, she reveals to her father that she is Spider-Woman. 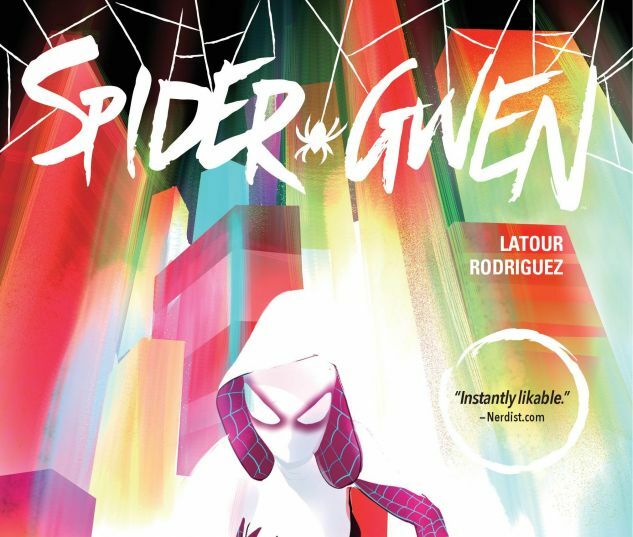 After the Spider-verse event Gwen goes back to her ordinary life of bumming around by day and Spider Woman-ing by night. Since Gwen revealed herself to her father he left the Spider Woman case and the investigation was passed on to detective Frank Castle. Gwen is also failing to meet the expectations of her friends and is living life one moment at a time. Suddenly the villain Vulture appears, secretly working for the King Pin: Matt Murdock, and causes trouble for Gwen (Spider Ham appears for a short time as a hallucination because of an attack). Gwen defeats Vulture and in the end he is put away, Murdock continuing to influence him from behind bars. Frank Castle increases his efforts against Spider Woman becoming more and more ruthless. Castle eventually makes a connection between Spider Woman and decides to enlists the help of Kraven the Hunter to perform a siege on the Stacy house. Castle and Kraven brutally beat down Gwen after she gets her father to safety. The volume concludes when Gwen decides to make a stand to Castle and not run any longer, blindsiding him as he unmasks her and getting away. Gwen is now unsure of how secure her secret identity is as she hides from her father and awaits the recollection of Frank Castle. Her problems are put to the side when a Lizard appears on the streets, seemingly having taken something like Peter Parker’s formula. The dog of Spider-Gwen “arch-nemesis”, Bodega Bandit, is eaten by the Lizard. Tracking down the Lizard into the sewer, Spider Woman encounters a pack of Lizard men and fends them off with all her strength until finally Earth 65’s Captain America, Samantha Wilson, shows up to capture the Lizards and surprisingly Spider Gwen as well. Gwen battles furiously with Cap all while avoiding the Lizards as well up until Gwen saves Cap from the Lizards and gets leaves her on good terms (Gwen gifts Bodega Bandit a hamster named Pine Cone at this point as consolation for Bandito being eaten). After a quick chat with Jessica Drew of Earth 616, Gwen and The Mary Janes go on a camping trip where Harry Osborn makes a surprise appearance. He explains his connection with S.H.I.E.L.D. and his motive to go after Spider Woman. He appears nights later in a green mechanical suit accompanied by an army of orange robots to kill Spider Woman. After an issue-long battle, Harry sets off an explosion to even the playing field. As Gwen lies on the floor, Harry drinks a vial of the Lizard formula and unmasks her to his surprise. After an issue break from the fight of George Stacy conversing with Matt Murdock, Gwen resumes her fight with a now mutated Harry Osborn with the assistance of Captain America. Gwen eventually convinces Harry that he is in the wrong and allows him to run from S.H.I.E.L.D. Gwen in the end reconciles with her father and he quits his job.